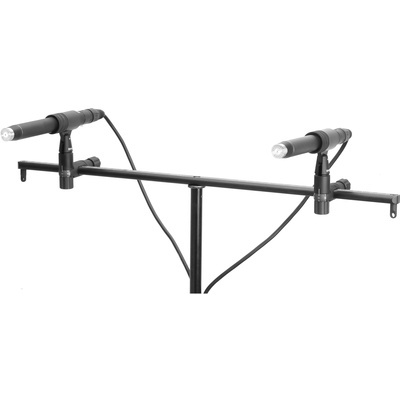 Product #20638 | SKU 3506A | 0.0 (no ratings yet) Thanks for your rating! A kit for the crucial capturing of instruments or vocals. The 3506A Stereo Kit with 4006A Omnidirectional Microphones by DPA Microphones is a kit for the crucial capturing of instruments or vocals in recording and live sound reinforcement applications. The 3506A kit includes two frequency matched 4006A omnidirectional microphones; two APE30RS acoustic pressure equalizers, 30mm ball; two APE40RS acoustic pressure equalizers, 40mm ball; two APE50RS acoustic pressure equalizers, 50mm ball; two DD0251 free-field grids, silver; two DD0254 close-miking grids, trapezoid silver; two DD0297 diffuse-field grids; two UA0777 nose cones; two US0896 foam windscreens; two UA0961 microphone clips; and one UA0837 stereo boom excluding holders. The specially selected 4006As are matched within ± 0.5 dB on frequency range, sensitivity and self noise. The high sensitivity, low noise-floor and extremely linear frequency response of the microphone pair makes the 3506A kit a great choice for all professional A-B stereo recordings.